Just pulled this cool looking bottle out of my fridge (the color on my iphone photo is a bit off – the bottle is actually a very vibrant blue). Another Friday night and another German Riesling! 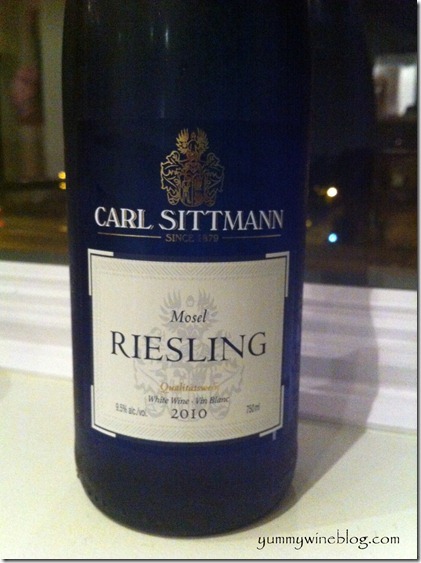 This Carl Sittmann Riesling is pretty common in the US, and it’s pretty cheap. The 2011 vintage is only $9.99 at Gary’s Wine. My verdict? A cheap sweet swirl in the mouth is all you’ll get out of this one. It’s especially disappointing considering you could get a great Riesling for around $20 (e.g., Gunderloch). But if you’re looking for an easy-to-drink cheap sweet wine, then this is it! Copyright text 2018 by Yummy Wine Blog.